Making All Things New: Restoring Joy to the Sexually Broken. This book is a gem—small, yet very valuable. It is no easy task these days to take an unequivocal, confident stance on matters regarding sexuality as a “traditional” Christian, while projecting one’s self and concerns in a compassionate and attractive manner. 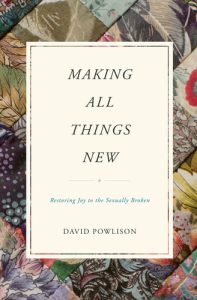 David Powlison achieves this in an intensely practical and realistic little book. The author is a skilled and experienced counsellor, as well as a deeply-grounded and knowledgeable Christian. He uses the themes of renewal and struggle to guide his readers to a life of hope and strength that will endure for the long haul of learning to overcome sin and find visible, everyday glory in renewal. Indeed, this book could well serve as a primer for a solid understanding and practice of sanctification. Powlison is straightforward and yet very tender in his approach. Compassion permeates his writing. Even so, he is realistic and sensitive to the huge task of learning to believe and think and live in a new way, as a renewed person. His book is about change—change that is difficult (impossible, really, without divine help), change that is rewarding, change that holds real, even eternal, hope. Highly recommended for anyone hungering for good and real change and renewal. Available from Amazon and Crossway and other book sellers. Thank you to Crossway for providing a complimentary copy of this book through the Blog Review Program.